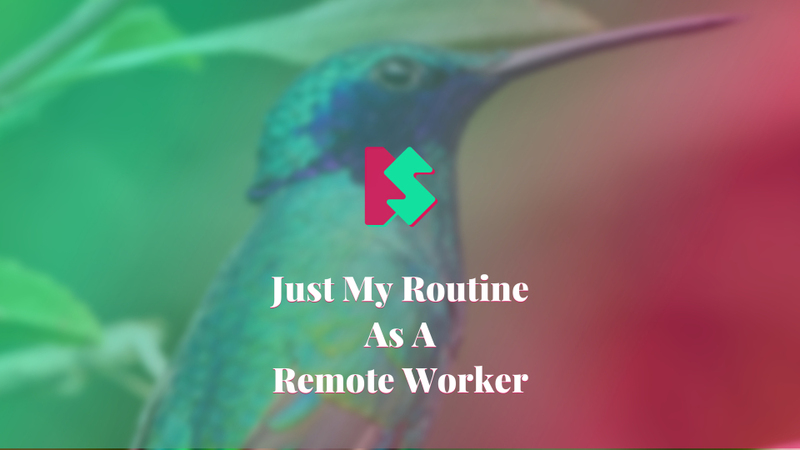 As a remote worker, having a routine and self-discipline is critical. Keeping up with multiple clients, personal projects, and continually improving your skills is a challenging task. Here’s my recipe on how to stay sane and be a more successful remote worker. The inspiration for writing this article comes from an article about remote life and from a prominent discussion on Gun.io Slack channel. 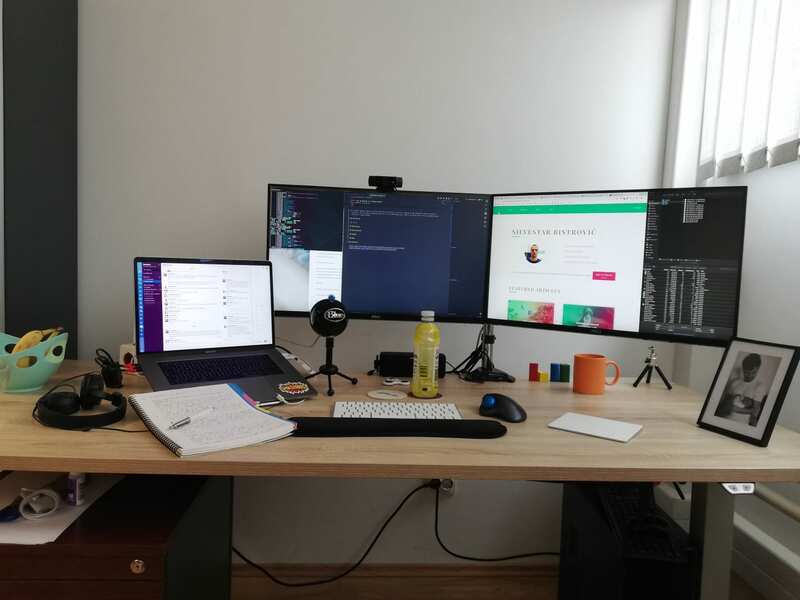 Moving from the home office to an actual office changed my daily routine the most. Getting up, dressing, driving/cycling to work makes me feel like I have a regular job. Not to mention that working from actual office makes me more productive and focused. There are no distractions, just the working environment set up for delivering the best possible work. As a remote worker, it could be challenging to have strict work hours. If you are your own boss, you could arrange work hours by your preference. The important part is to stick with it. I noticed that having a clear schedule when I begin and finish with the work helped me tremendously to organize my workday. I am a morning person, and I like to start working as soon as possible in the morning. I get up every day at the same time, and I am so used to it that my body already knows when to wake up without even setting up an alarm. I wake up early even over the weekends. When I come to the office, I often start with a simpler task, and then gradually progress to the most complex ones. After a couple of hours, I like to take a break that involves walking, usually to my favorite coffee shop or bakery. After the break, I tend to work in a single long sequence where I could intensely concentrate on resolving most of my daily tasks. I try to avoid any distractions that could occur during this period. When you are your own boss, there is nobody who makes you work, and you could spend time on non-related things. Having strict self-discipline is really tough, especially if you working on a computer. Scrolling social media, reading the latest news or articles could lead to a severe situation with deadlines. I don’t have any particular method of how to handle those distractions. When I feel like taking a short break to check my Fantasy team or to watch Snooker World video, I stop working and that’s it. I usually don’t get caught in opening more than two or three links/tabs. Every Friday I start my workday by reading newsletters and saved articles. But I do have a routine for keeping up with the latest technologies. Every Friday I start my workday by reading newsletters and saved articles. I feel perfectly fine if I don’t read the most recent news immediately. What matters is that I read it eventually. New CSS specs probably couldn’t help me at the moment anyway. There are situations when I work from home. Sometimes I just don’t feel like leaving home (usually when it is rainy). I know I would struggle to get the job done, but these days I don’t have complicated tasks anyway. Working without my 2 external screens could take much more time, too. It is essential to have an understanding with your household members to be left alone during that time. There are exceptions when interruptions ok, like when I am writing a draft for my new blog post, or when I am playing with a CodePen demo. If the situation doesn’t require my full attention, I like to “watch and work.” Sometimes it is my favorite TV show, and sometimes it is just sport (any sport, really) that is playing in the background while I am working. And there are situations when I like to talk to my wife or watch my daughter play while I work. When I feel especially exhausted, I just leave my MacBook in the office. Actually, I prefer to leave it there for most of the time. I realized that I cannot entirely rest if I use my computer at home, even just for fun. I relax best when I am bored. Boredom is underrated—you should appreciate the time when you don’t have to do anything. Boredom is underrated—you should appreciate the time when you don’t have to do anything. Health is an essential topic when working remotely. I like to ride a bike during warm days. I play recreational football for a couple of times per week. I am not in the best possible shape, but I do feel comfortable in my body. Mental health is important, too, if not the most important. I think you couldn’t produce the best work if you are having constant struggles. What keeps me sane is my wacky family, my super understanding wife, my hilarious daughter, and my friends. I go to a pub with my friends regularly. All my work problems magically disappear when I am with my friends watching sports, bowling, playing darts or cards, or just drinking beer and enjoying the conversation. Most of my friends are not developers, so talking about work is rarely an issue. Working alone in the office could lead to some issues, too. That’s why I try to keep in touch with my friends by going to coffee in the middle of work hours (preferably in the morning). I also like to have a quick video call with my wife and daughter just to see what they are up to. I don’t like any sort of messaging, but I could see how that could be helpful, too. You could improve your mental health by having a hobby. I like to work around the house as some sort of handymen. I enjoy fixing and improving my home while my dog keeps me entertained. A simple fix of squeaky doors or loose screw could do wonders for me. I also like to watch a lot of sports. I don’t consider this as an actual hobby, but it keeps me relaxed, and I do it daily. Approximately once a month my family is taking a trip to the countryside to see the family. I often go there to help with some domestic chores, and that usually implies physical work. Spending time on fresh air is precious. It feels so rewarding to go to bed after a day-long physical job. Alternatively, you could walk, run, bike, hike, or climb, as long as you are away from technologies. It doesn’t matter what you do, it matters that your mind would be away from projects, tasks, issues or bugs. I often have “aha” moments while I am away from my computer. Seeing things from another perspective is always a good idea. Getting enough sleep is common sense. I have scheduled my mobile device to turn off notifications from 10 pm until 7 am. I couldn’t possibly imagine what could be so important that I have to respond to anything in the middle of the night. All of my clients are very aware of my working schedule, and they respect my time, the same as I appreciate theirs. It is imperative to bring this conversation at the beginning of the engagement to avoid unpleasant situations. During my daily routine, I use several applications that help me get the job done more quickly and more efficiently. These are not productivity applications in the full sense of that word. The first one is the Station application. I use it mostly for my Google Mail, Google Drive, Google Calendar, Zoho Mail, Trello, Asana, and Slack. Jumping between applications is quite easy. Plus, I don’t have a lot of open browser tabs that clutter my browser. 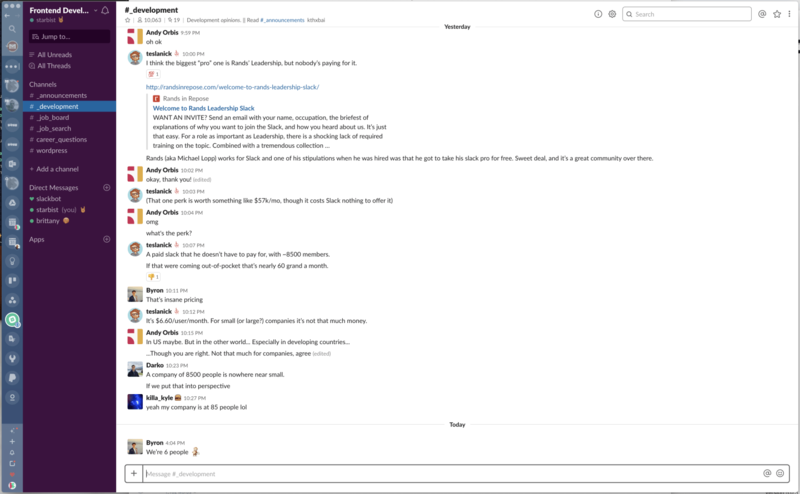 Another thing I noticed is that I spend way less time on Slack since I docket it inside the Station. Not seeing the “unread” dot makes me less stressed and I don’t feel guilty for not reading the latest messages. If I want to get distracted, I just turn on the volume on my mobile device. The second one is the Workona extension for my browser. My browser workspace is a lot cleaner when I could group related tabs in a meaningful entity. 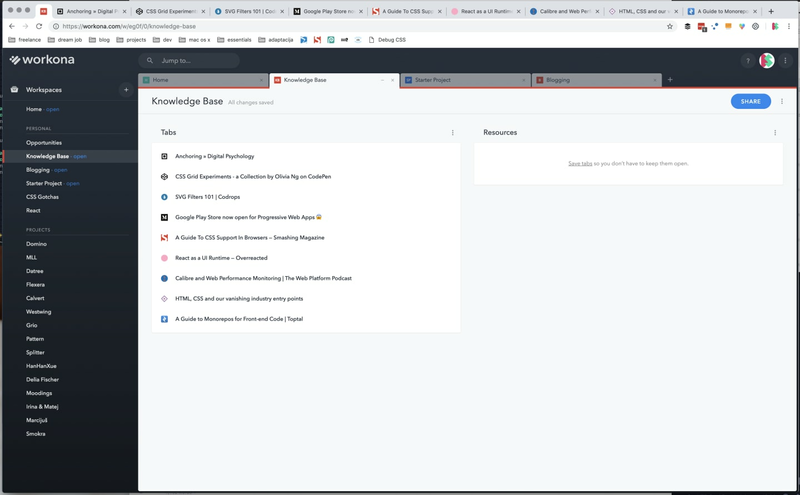 For example, my “Knowledge Base” workspace contains articles and tutorials that I would want to read later, and my “Blogging” workspace contains links for tracking and sharing my blog. I also like the sync option that allows me to open my links on a different device. 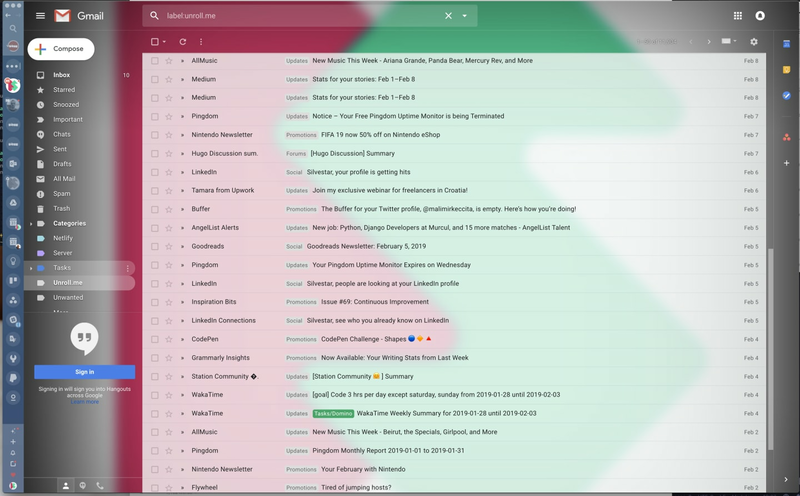 Unroll.me is a service for email management. I have set up a significant number of not-so-important emails that I could read daily. In my case, I get the Unroll.me email every morning, and I could quickly glance through emails and see the latest highlights. Important emails are not going through Unroll.me, so I still get those at the time. I hope this information could help you become a happier remote worker. If you have any advice you want to share, I would like to hear them. After all, some of my routines were adopted from articles I read before.